It started out as a crazy idea, the kind that you blurt out of your mouth before your brain’s common sense kicks in and keeps you from saying things like “I love you” on the first date. We were driving in the car, it came up, and without really thinking extensively about it I merely suggested it. Ultimately, I completely understood her decision and was supportive 100% – which led to us driving downtown one day and me casually asking when she was heading out West, which led to me asking if she needed any help – and her wondering if I would be down for a road trip. I quickly calculated how much vacation time I had left (because, you know – adult and full-time job stuffs), and enthusiastically agreed it was a splendid idea. Suddenly, her move was something to be celebrated, and we got cracking on our plans. Which leads us to day one of our trip. I had a brand new and compact suitcase, that possessed only the bare essentials (my Backstreet Boys tour shirt and my I “less than three” Star Wars shirts, obviously) tightly rolled up in little fabric crepes and burritos I had lovingly created at 5 in the morning. I had prepped myself – we had booked hotels, I had planned for all kinds of weather, and my bladder was prepared for many hours between rest stops. Our journey was going to take us four days and 2,000 plus miles across country. Because we weren’t just moving K, but making fun memories that we will keep with us always, we were also going to hit up national monuments and memorials (note: there is a difference) along the way. The worst day of driving would be Day 1, going from the beloved Dairy State to Rapid City, South Dakota. Give or take – 12 hours of driving. Thank God for comfy, stretchy, oh-so-wonderful leggings. Here begins the (hopefully) interesting written account of our cross-country adventure. Over the next few weeks, I will go into detail about what each day shared with us, as well as things I learned from a traveling standpoint as well as things I learned about myself as a person. K hugged her roommates (her second family for the past four years post college), I settled into the driver’s seat, plugged in my Epic Road Trip playlist, began the Lindsey Stirling, and we were off. K had me start driving because since she was moving from the state she had called home for the past eight years and saying an extended “see you later” to the countless friends (let’s be real here – the girl seriously has a colony that is her fan club) she had made during that time, it was understandable there might be some of those things called emotions during the first leg of our journey. However, spirits were kept rather high. We were making excellent time, after an hour or so we arrived to the singing-along portion of the playlist, and chatted and caught up on things that happened in our lives since the last time we saw each other (which had literally been two days prior). We crossed the mighty Miss a sip, and before we knew it we were nearing the halfway mark of Day 1 of our travels. Then I remembered we had a ’99 Taurus loaded down with my dear friend’s belongings and rejoined the slow lane. Day 1 – Around 2:30 p.m. – ??? We had agreed upon stopping in Sioux Falls, SD for gas and to stretch our legs, as well as switch positions with driving. 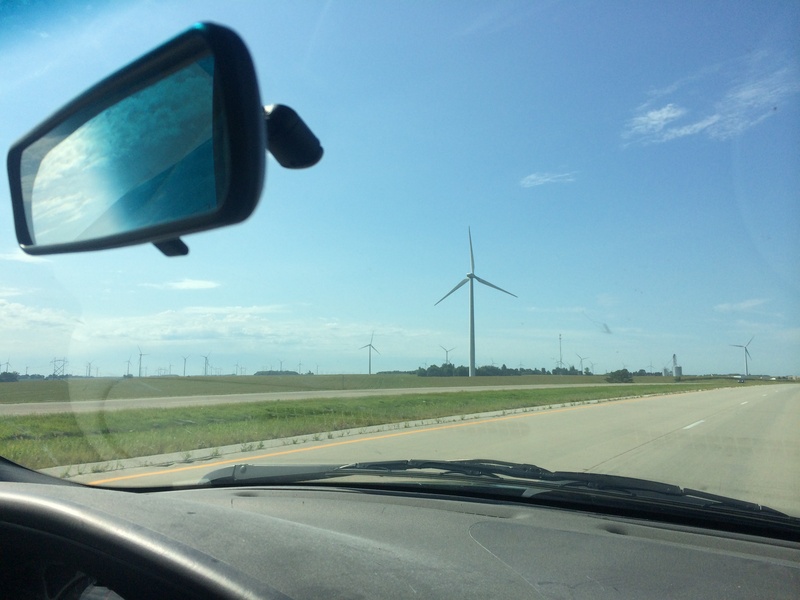 However, we hadn’t seen any major cities for awhile, and we were debating if we were still in Minnesota or had somehow entered South Dakota without even realizing it. On top of that, our amazingly smart and highly expensive location finders (read: mobile phones) were receiving no signal. Coming upon a rest area was a Godsend, and we found out we were about an hour into South Dakota via a bulletin board map with a lovingly YOU ARE HERE scribbled above our location in Sharpie marker. Apparently, South Dakota doesn’t like to welcome you to their state. And – to be honest – for good reason. Now, this is not to come across as disdain for the state of South Dakota. 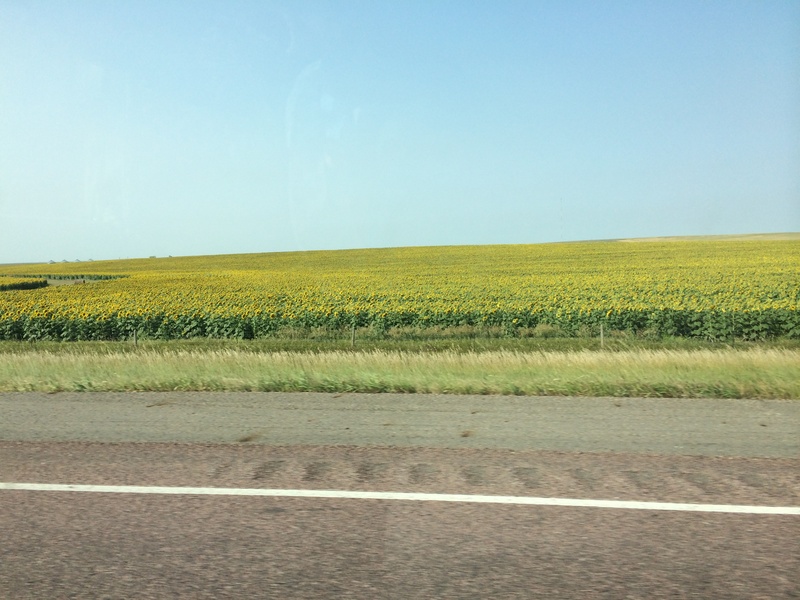 They grow a lot of crops that help feed the rest of the country, and they also house a booming tourism industry and economy in Rapid City due to Mount Rushmore, Crazy Horse, and other exciting area attractions. However, with all that said, getting to Rapid City is the least interesting trek you will ever make. 3) Exciting billboards for WALL DRUG, advertising it is only 260 miles away and counting. There is a reason the speed limit is 80 miles per hour, and sadly even the novelty of that begins to seem slow once the scenery becomes repetitive. And this is where our trip began to struggle. For starters, K gets cranky when she is hungry. I get cranky when I’m tired. On top of that, something I had eaten earlier in the day was not agreeing with my stomach, and the only way to not focus on it was to close my eyes and sit in the fetal position in the passenger seat while K played some Spice Girls (which, was oddly soothing) and some Frank Sinatra. This also meant K had to power through an extra hour of driving, with no help from me. I have never been so relieved and excited to see so much consumerism and commercialism and name brand stores on top of each other when we reached the edge of Rapid City just shy of dusk. 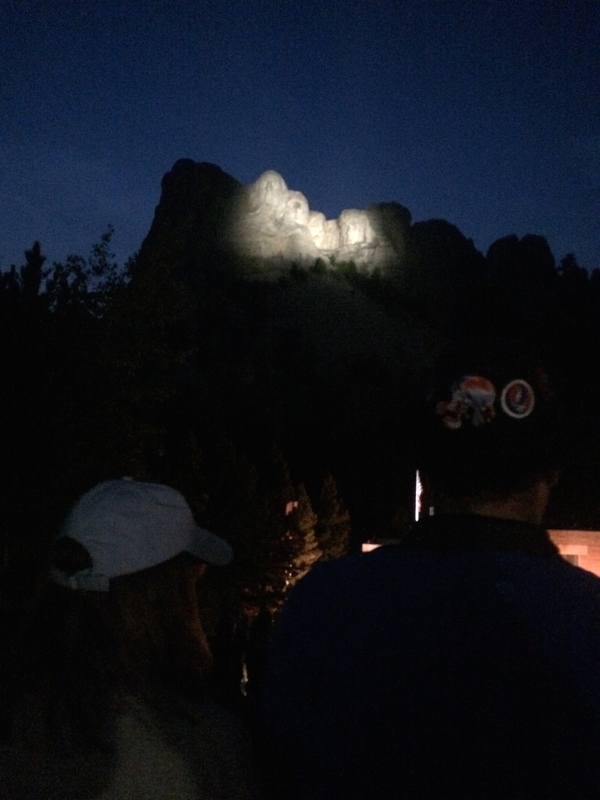 We had made it in time to check into our hotel, grabbed dinner at Culver’s (K had her last frozen custard – for awhile – not too far from where Custer had his last stand…), and zoomed over to Mount Rushmore for the evening lighting ceremony. We hurried up the steps – selfie sticks and tourists galore – and made our way to the outdoor amphitheater at the base of the mountain. A park ranger came out, talked about the history of the memorial, and then showed us a video that went into great detail. At the end, “America the Beautiful” was played, the four presidents’ faces were suddenly illuminated, and I was surrounded by the thousands of expensive camera flash being used by inexperienced photographers. The initial part of the ceremony was informative, and interesting to say the least. It was also very cool to see Mount Rushmore in person, however it is true what they say – it is much smaller in person (spoiler alert?). However, you do feel a sense of pride at what each of those Presidents were able to bring to the table (even if some of what they brought wound up screwing over other people – more on that later). The best part of the evening though was when they invited current and past service members to the stage to assist with the flag lowering portion of the ceremony. The stage was filled with over a hundred people, and it was great to thank them in such a prestigious and memorable place. After the ceremony finished, everyone scurried to get to their car or the gift shop. K and I sat for awhile, in no rush to be anywhere, and simply stared at the faces of George Washington, Thomas Jefferson, Teddy Roosevelt, and Abraham Lincoln. That was one of my favorite moments of the trip: sitting in 50 degree weather just passed sunset, bundled in a sweatshirt, swatting at mosquitos, and looking up at something that has become extremely iconic in the States. With a quick swing into the gift shop, nabbing some postcards since our photos hadn’t turned out great (partially due to the fact Kristen’s camera and my phone were dead), we headed back to our hotel, where we nosedived into the most luxurious bed of beds. 2) Make sure you have a playlist filled with variety so it can appease both drivers, as well as different songs for different moods along the journey. 4) Bring snacks and stay hydrated. Don’t drink too much – the rest stops are spaced greatly apart – but bring water or some Gatorade to keep you from getting headaches. 5) If you are traveling 12 + hours by car in one day, be kind to yourself and upgrade to a nice hotel. Your body will thank you, and you will be ready to tackle driving again the next day completely refreshed. Stay tuned for Day 2 – This Means Something, WY!